This article focuses on a mistake in the front crawl arm recovery called Putting on the Brakes. Not every front crawl swimmer has such a good hand position at the end of the arm recovery. Putting on the brakes is a mistake in the front crawl stroke that can occur when the arm extends forward underwater during the recovery. Normally your recovering hand enters the water in front of the head with a slight downward angle, before it sweeps forward parallel to the water surface in a straight line. Your arm simply follows behind through the hole opened in the water by the hand until your arm is completely extended. 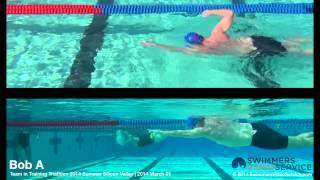 Now it often happens that swimmers sweep their hand forward in an arc rather than a straight line. The hand is first angled down when entering the water, then is brought parallel to the water surface midway through the underwater recovery, and finally is angled up when the arm is completely extended, just before the active phase of the arm stroke starts. As a consequence, the swimmer pushes water forward at the end of the recovery, which slows him/her down. This is one of the cases where swim paddles can be useful to improve one’s swimming technique. The pressure of the water against the paddle will make you more aware of the angle of your hand while recovering your arm forward under water. It is, in fact, more difficult to recover your hand forward underwater with a swim paddle if it is not parallel to the water surface. So it can be useful to swim a few lengths of front crawl with swim paddles regularly to correct this mistake. Over time your awareness about the angle of your hand during the underwater recovery will improve and you will be able to correct this mistake. One word of caution, however, don’t use swim paddles too much because this can lead to swimmer’s shoulder. I’ve got a pupil that has got a very strong cycle kick. Have you got any ideas that can help to get her out on it? I’d suggest that he/she tries to have her big toes touching during the flutter kick. And he/she should really focus on this. This should make him/her point her feet, which should make him/her straighten the legs and kick less from the knees a more from the hips. Nice tips, but I want to know more about single side breathing? Is it wrong? It depends. As a beginner, it is important to learn to breathe on both sides, so that your swim stroke doesn’t become lopsided. On the other side, always breathing on the same side allows you to get more air, and can make sense in competitions. I have an extremely hard time staying afloat while swimming unless I wear a wetsuit or a pull buoy. It takes more energy and is usually disastrous after only 200 yards, leaving me treading water and breathless. Is there a trick, or just speed to staying level? This can have several causes. If this occurs while swimming front crawl, it could be that a lack of balance causes you to kick harder than necessary, leaving you breathless. Finally, if you are skinny and / or have low body fat, it could be that it is difficult for you to stay afloat. In that case it makes sense to use a wet suit or pull buoy. I am a 69 year old female. I haven’t swum in many years. I grew up swimming at the beach and in pools but was never a strong swimmer. I’m trying to perfect my front crawl. However, I hate putting my face in the water in public pools. Can I keep my face up and still swim the front crawl? 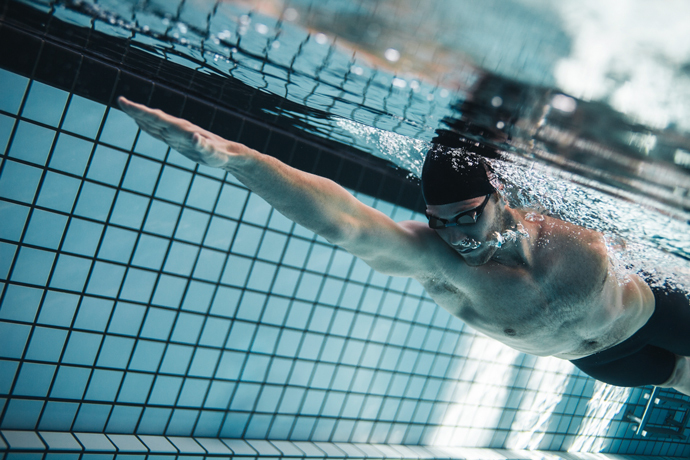 Even if it is possible to swim front crawl while keeping your face out of the water (after all, that’s what water polo players or lifeguards do), it’s very tiring and also puts a lot of strain on your neck. So I wouldn’t recommend it for regular practice.